The Waterfront Tech Series has been taking Baltimore by storm over the last year! Founded and produced by Laura Gaworecki of MOXIE Promotion, the quarterly networking and learning breakfast showcases the city’s crown jewels: our Inner Harbor and our innovative spirit. 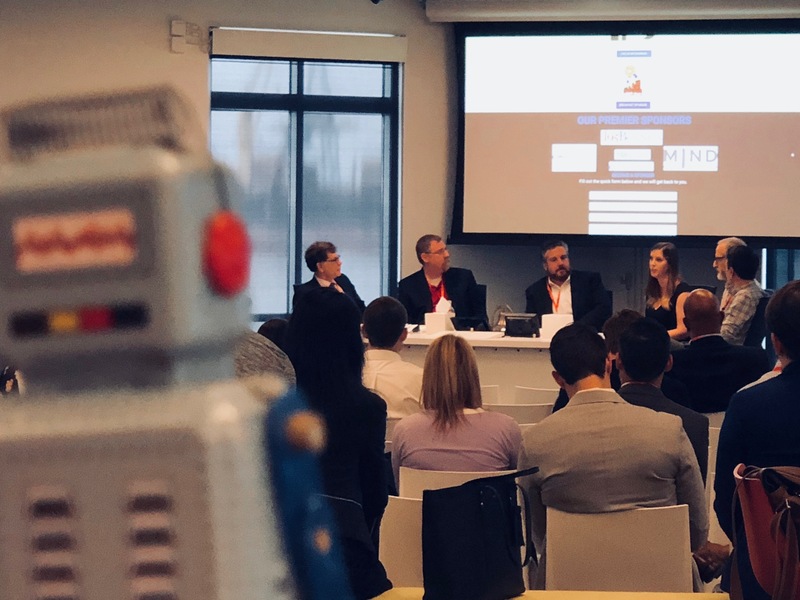 Episode 4: The Future Is Now brought together heavy hitters from Charm City’s law, finance, real estate, marketing and, of course, tech sectors to discuss how artificial intelligence, blockchain and virtual reality are revolutionizing their industries today. The lively and informative conversation that ensued was suitable for tech gurus, Luddites and everyone in between. #WFTSeries panelist and Mind Over Machines Director of Emerging Technologies Tim Kulp laid the groundwork by likening blockchain to the 2nd grade lunch table: two kids swap sandwiches and everybody else at the table attests to the validity of the trade; no controlling authority necessary. If you read our blog regularly (or if you just followed the links above), you know how these hot emerging technologies are impacting business right now. But just like at CES, the keynote speakers were only part of the action at this latest installment of the Waterfront Tech Series. Table demos, built by some of our best and brightest MINDs, brought these abstract tech concepts to life. We harnessed the power of Microsoft cloud-based platforms to create three tools that illustrate three aspects of today’s digital transformation: (1) understanding your data, (2) working with your data, and (3) talking to your data. When you integrate all three capabilities, you unlock countless ways to work smarter. We’ve been hearing about the Era of Big Data for a decade now. Companies are bingeing on data, accumulating as much as they can about every aspect of their business. But how can you best put all that data to use? Power BI turns your data into actionable, quantifiable intelligence. In our demo, we showed how Power BI can be used to visualize HubSpot marketing information, discovering hidden insights in data from one of our recent email campaigns. We chose to spotlight Power BI using HubSpot data for two reasons: (1) HubSpot is popular here in Baltimore, and (2) Microsoft Office is so prevalent in business today. Power BI is its versatile, uber-customizable suite of business analytics tools that you may already have in your tool belt without knowing it. We wanted to show how you can use Power BI to extract information from your marketing metrics just like we do. The demo even built data visuals illustrating the conversion funnel all the way from initial emails to event signup. Consider the lid blown off this best-kept secret: Power BI is a great way for you to unlock the compelling, actionable stories hidden in your data. Data is a living, growing, evolving thing, but it doesn’t just magically gather itself into convenient form. You need tools to create, update and transform your data. That’s why our second #WFTSeries demo was a Microsoft PowerApp that quickly and easily collects attendee contact information into HubSpot. The PowerApp sports a simple interface anyone can use to manage HubSpot contacts. It runs on tablets, smartphones and the web all from one build. We even embedded it into our Power BI dashboards to allow direct entry of new data into both HubSpot and Power BI, keeping your data clean and consistent throughout your ecosystem. In short, our PowerApp demonstrated how Microsoft Power BI, PowerApps and Flow provide a seamless experience from data collection to transformation to visualization. Must’ve been complicated to build, right? Wrong! The HubSpot contact management PowerApp was built in a visual interface much like PowerPoint, using basic functions like Excel. If you can use Excel, you can build a simple PowerApp. As an emerging tech guru, Tim’s been getting lots of invites lately to talk about Artificial Intelligence (AI). What he has found is people are sick of hearing AI buzz. They want to see it in action with tech that actually has business value. That’s why we brought Milton to the waterfront. Milton is our internal knowledge base. He uses an AI technique called Natural Language Processing (NLP) to understand questions and answer appropriately. At the event, Milton answered attendees’ basic questions about Mind Over Machines via text messages and Skype. Milton is a bot. Not the scary bots you hear about invading privacy and poaching data, but a bot we use at Mind Over Machines to answer operations questions and help team members stay informed on company happenings. We’ve kept Milton pretty simple, and we use him primarily for internal communication. But bots can talk to employees, other machines or external audiences. Bots allow users to access your data in new and exciting ways, learning and interacting in a conversational manner that feels more like chatting with a person than a lifeless robot. They can be as sophisticated as you need them to be, overseeing complex business processes or answering customer service calls. Powered by AI systems like Azure Cognitive Services and Amazon Polly, bots can provide your customers with friendly, fast service, and provide you with unprecedented access to your customers’ journey with your brand. How might bots enhance your business? What Can Tim’s Team Help You Build? Data will always be key to your business decisions and growth. Today’s emerging tech is about finding new, smarter ways for your company to present, interpret and interact with that data. Tim is all about humanizing tech and empowering business. That’s why he was so energized by this latest Waterfront Tech Series and why he can’t wait to attend Baltimore City Chamber’s Annual Meeting: Committed to Baltimore next week. If you can’t catch him there, why not reach out via LinkedIn or a standard email? The Future is Now, and Tim would love to discuss yours with you.